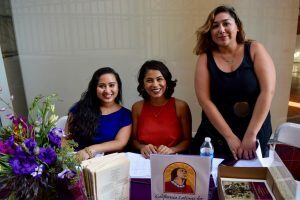 California Latinas for Reproductive Justice(CLRJ) is a statewide organization committed to honoring the experiences of Latinas/xs to uphold our dignity, our bodies, sexuality, and families. We build Latinas’/xs’ power and cultivate leadership through community education, policy advocacy, and community-informed research to achieve reproductive justice. At CLRJ we recognize that Latinas’/xs’ reproductive health and rights cannot be viewed in isolation. So we do our work using the reproductive justice framework that emphasizes the intersection with other social, economic and community-based issues that promote the social justice and human rights of Latina/x women and girls and the Latinx community as a whole. In other words, we recognize that Latinas/xs’’ access to culturally and linguistically appropriate health care, a living wage job, quality education, freedom from discrimination and violence, among many other issues that affect Latinas’/xs’ daily lives, have a profound effect on Latinas’ reproductive and sexual health, as well as our right to self-determination in all aspects of our lives. In addition to these core strategies, an important value that permeates all aspects of CLRJ’s work is that of working in collaboration with other allies who share our commitment toward promoting the health and justice of our communities, including grass roots activists, community leaders and coalitions, policymakers, policy advocates and researchers. To learn more about our programs please visit the “Our Work” section.